Historic buildings and places offer invaluable opportunities to experience America's rich heritage. Citizenship projects support our veterans and active military families, new immigrants, and local communities and libraries. The NSCDA-MI essay contest provides an opportunity for Michigan students to visit Washington, D.C. with the Washington Workshops Foundation. 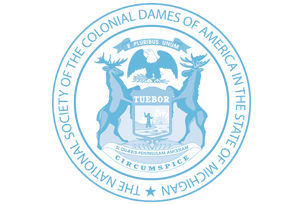 The National Society of the Colonial Dames of America in the State of Michigan (NSCDA-MI) always encourages programs and collaborations that stimulate current interest in our national heritage. By sharing ideas and participating in historically significant projects and family research, members acquire new skills, learn about their ancestry, and discover surprising national, state and local historical facts. With over 15,000 members in 44 state Societies, the National Society of the Colonial Dames of America (NSCDA) is a leader in today’s preservation and interpretation of historic sites, traditions and events. Headquartered in Dumbarton House in Washington, D.C., it sponsors preservation and patriotic projects, educational programs and history scholarships to promote contemporary awareness of our national legacy.